Outdoor self park airport parking lot near JFK Airport NYC. 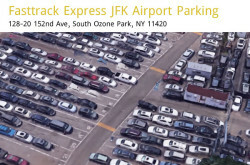 Located 7 minutes (1.6 miles) from the John F. Kennedy Airport. Online Rates Starting at: $5.95/day. * $3 extra charge for SUV. South Ozone Park, NY 11420, USA.